Chompie’s is now open in Glendale. It opened the doors of its fifth location in the Arrowhead Towne Center on Monday, April 11. Hours of operation are 6 am – 3 pm with plans to extend to dinner hours later in May. The new location opening at 7700 W. Arrowhead Towne Center #1145 in Glendale features approximately 6,100 square feet of dining space to accommodate up to 200 guests enjoying the made-from-scratch selections the family run restaurant is known for. “Our expansion to the West Valley allows us to continue to share our homemade treats with the people we cherish,” said Chompie’s owner Lovey Borenstein. Chompie’s has been Arizona’s New York Deli since 1979. It started when the Borenstein Family – Lou, Lovey, Mark, Neal and Wendy, came to the Valley from Queens, New York with a dream. That dream materialized into a reality with Chompie’s, an exciting New York style deli, restaurant and bakery featuring freshly baked New York-style breads, cakes, pastries and, of course, bagels and bialys in 35 hot varieties. Chompie’s quickly set new standards for itself and the entire Valley by giving customers the ultimate in East Coast tradition. It now serves breakfast all day long, lunch and dinner seven days a week. Its dining menu has come a long way in 37 years. 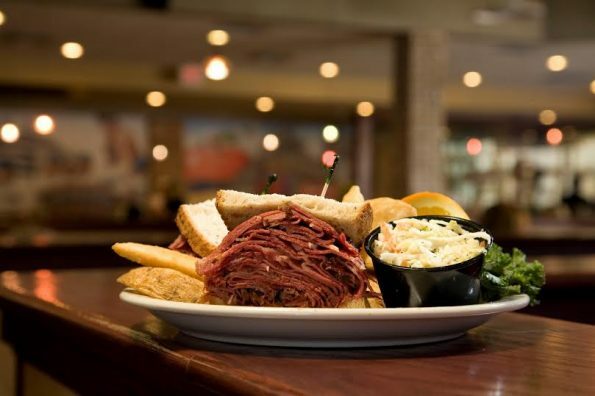 Chompie’s is well-known for its generously portioned dishes made using the finest ingredients and authentic family recipes handed down through the generations, many from the Borenstein’s Polish and Russian Jewish grandmothers. The first Chompie’s was located at 32nd Street and Shea. Today there are four locations all over the Valley in Phoenix, Scottsdale, Tempe and Chandler. You can find details about Chompie’s locations, menu and specials online at Chompies.com or on Facebook at facebook.com/ChompiesDeli.